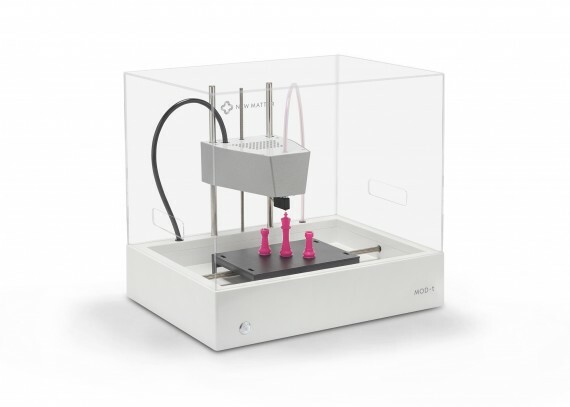 The MOD-t is a high-quality, affordable 3D printer just about anyone can use. Users can print a wide variety of desirable objects from the New Matter Store, a fully curated 3D design marketplace that is optimized to work with the MOD-t. The result is an affordable, accessible and seamless, end-to-end 3D printing experience created with the customer in mind. Despite a surge of interest in 3D printing and the distributed creativity and productivity it promises, there has yet to be a 3D printing solution that empowers and engages the broader mainstream market. New Matter approached frog with a vision to launch the most accessible and fully-featured consumer 3D printer, paired with a curated store of high quality 3D models preconfigured for effortless printing. frog’s interdisciplinary team of researchers, strategists, designers, and technologists worked closely with New Matter to co-develop the company’s experience strategy and product design—from branding and identity to the design of the printer, store, app, and packaging. frog then shot the company’s crowdfunding video, and collaborated with the team on the launch of the campaign. frog redefined the 3D printing journey starting from the fundamental question: Why should someone own a 3D printer? To answer this, frog collaborated with New Matter in the creation of a product and service ecosystem that is approachable for users of any level of 3D experience. Our goal: to make printing an object as easy as sending a text message or downloading an app for your phone. The cohesive and intuitive design of the MOD-t and New Matter Store make it extremely easy to purchase, personalize and print 3D models. The printer is designed for home use and engineered for simplicity and reliability. The MOD-t 3D Printer uses an ingenious, patented 2-axis motion system that simultaneously moves and supports the build plate with very few components. This breakthrough technology allows the MOD-t to print more consistently, while also making the printer exceptionally affordable. The New Matter Store is optimized for and fully integrated with the MOD-t, providing high-quality, curated designs from today’s most talented 3D designers and artists, and solving the problem of the typical consumer’s limited access to quality designs to print. “Pride of authorship” is perhaps the next evolution of “pride of ownership”, and with this in mind, the New Matter Store’s social and sharing capabilities will enable users to send physical objects to friends as easily as sending a text message. With hardware and software designed for simplicity, reliability, and intuitive operation, the MOD-t 3D Printer brings the creative excitement of 3D printing to everyone.